An engine is a lot like a human body. It’s full of moving parts and fluid. It breathes in and out, just like you or I. Except instead of lungs and a heart, it has cylinders and a crankshaft. Its blood may have an octane rating, but like your body, an engine needs fresh air to survive. 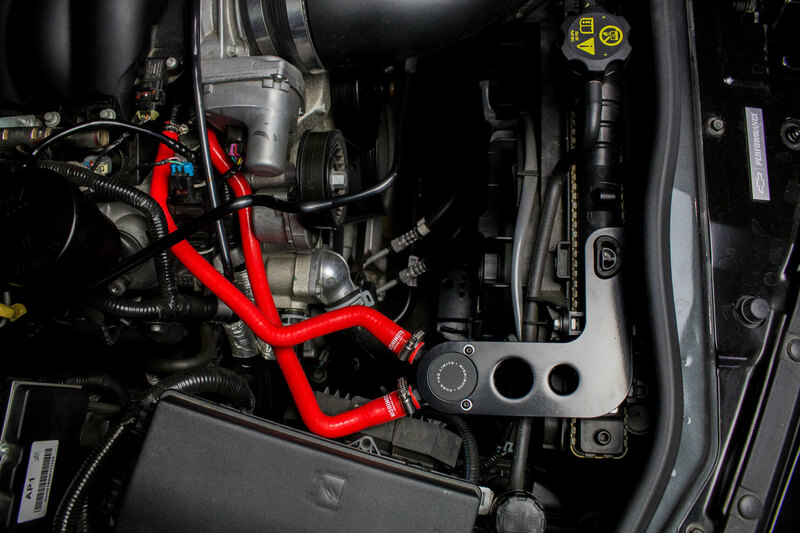 Blow-by finds its way into your engine’s lungs, compromising its airways, and choking the power out of it. Imagine having a chest cold, but instead your lungs are full of oil and unburned fuel; I bet you wouldn’t run well either. The clear catch can bottoms we use for R&D allow us to quickly gauge the level of blow-by in the can, but unfortunately, the clear bottoms don’t hold up very well to long-term use. The engineers here at Mishimoto have been developing a catch can for your 5th-gen Camaro SS to help it breathe the clean air it needs. The last update ended with a completed prototype awaiting testing, but we had run into another challenge. Thanks to Alex’s generosity, we were able to develop our prototype oil cooler, radiator, and this catch can. But Alex’s Camaro spends its summers at the track and its winters keeping warm in the garage. So, this particular SS wouldn’t be driven for the 1,000+ miles needed to test the catch can. We reached out to the forums to help solve our problem and were lucky enough to find a beautiful 2015 1LE. Thanks to Steve, who bravely pilots his 426-hp beast through the Delaware winters, we began our testing right away. Jason and Josh wasted no time installing the catch can on Steve’s Camaro and it was off, set to return in 1,000 miles. The blow-by that we caught in our 5th-Gen Camaro SS catch can looked to be nearly 100% oil. Fast forward a few weeks, which is when the 1LE returned to determine if our catch can had captured any blow-by. What we found in the can was promising. Usually, we open the can to find a mix of oil, fuel, and water, the usual blow-by suspects. Fuel and water are almost always present in blow-by. Fuel, most obviously, because it’s injected into the cylinder. Some fuel leaks past the rings during the compression stroke and ends up in the crankcase. Water’s presence in blow-by is a little more complicated. This image of blow-by caught by our BMW N55 catch can kit illustrates what oil, fuel and water look like after exiting the crankcase. Most would think that the only water in an engine is in the cooling system, but it’s actually quite common in the combustion chamber as well. Due to the ethanol content in most modern commercial fuels, moisture has become a normal by-product of internal combustion engines. The air that comes in through the engine’s intake also contains water. Most of this moisture is pushed out of the cylinder on the exhaust stroke, but some stays behind and is pushed past the rings along with the fuel mixture. Oil is present in almost every moving part of an engine, it only makes sense that it would be present in blow-by. In reality however, it’s rare to see only oil in blow-by. So, we were surprised to find 10ml of what looked like pure oil when we opened this catch can, . While it doesn’t sound like a lot, 10ml is more than enough to coat your intake, valves, and the tops of your pistons. Considering most Camaro owners change their oil every 3,000 to 5,000 miles, seeing this much blow-by in less than half of that span is proof enough for us. A sight tube is what I use to see the fluid level in my catch can.